Germans had been leaving their homeland to settle in parts of the New World since the 17th Century, but this became a massive wave of emigration in the 19th Century when many millions made the life-changing decisions to move to voyage by ship to a different continent, different language and different culture in the hope of improving their lives. The reasons for this were many; economic hardships due to unemployment, land tenure issues and crop failures, religious and political persecution, the avoidance of military conscription and wars or simply an overpowering sense of adventure. Amongst these were 223 people bearing the surname Briese. The attached tables show the names of Briese families and individuals who left their homes in Prussia during this period and settled in Australia, Brazil, Canada and the USA. They were compiled from on-line shipping records 1 and family trees 2,3 and have two purposes; as a reference for people interested in the genealogy of different Briese lineages and as source data for the Briese Family Y-DNA project, an attempt to discover the genetic relationships between different Briese families and lineages. The list should neither be considered as complete nor without error, as it is based on transcribed rather than original sources. There are also gaps in the details collected and the author would be grateful for any extra input or corrections (see contact details below). In total, 223 people with the surname Briese emigrated from Prussia between 1851 and 1899. The temporal pattern of this emigration is shown in Fig. 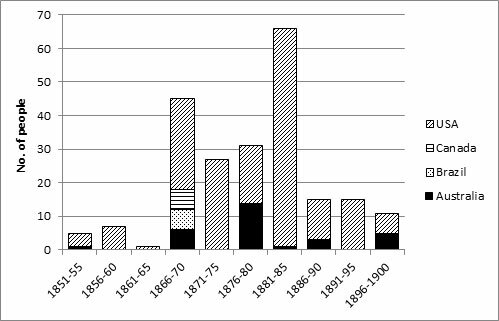 1 and shows that the peak period of movement was from 1865-1885.
in 5-year intervals during the 19th Century. The majority of these people crossed the Atlantic Ocean by ship to North America, though some sailed to the southern hemisphere, settling in Australia and South America (see Table 1). The table suggests that there are 70 potential Briese lineages (37 families and 33 single males) that could provide genetic data for the Briese surname Y-DNA project. In reality there are probably fewer, as individuals of the same family may have arrived separately, while not all families would have produced male descendants. Of these lineages, the place or region from which they originated in Prussia has been recorded in 32 cases (Table 2). (family or single male that potentially can carry on the surname). Interestingly, almost half of these come from one region, Deutsch Krone in Westpreussen. DNA comparisons have been made between three Briese lineages from in or near this area and showed them to be related 4,5. This suggests that genetic studies can show the relationships between different Briese lineages and can show how these are influenced by geographic origins. The Briese surname originated in what were the eastern provinces of Prussia 6, as shown in Table 2. As well as the emigrant families, many more Briese lineages remain in modern-day Germany, but they too have largely dispersed from the land of their origins as a result of the post-war expulsion of German-speaking people from former German territories in the east. The Briese family DNA study is equally valid in discovering the links between Briese lineages in Germany and their connections to their geographic origins as it is for those that have spread to other parts of the world. If participants from the different lineages can be found, the pattern of the Briese diaspora can be unravelled. Table 1. List of Briese emigrants to Australia. Table 2. List of Briese emigrants to Brazil. Table 3. List of Briese emigrants to Canada. Table 4. List of Briese emigrants to the USA.